I keep hearing that it's autumn now, all the magazines say so and school has started again, although technically I suppose the calendar has not quite caught up. But here in NYC, it still feels a lot like summer. We had a near-90 degree day this week, after all. Still, I love autumn and honestly I'm quite ready for it. So I don't mind bringing a little of that season in even when the weather is not quite cooperating. I was flipping through (I'm a little embarrassed to say) Food & Family magazine which I've been getting free in the mail since my college days when I was so intimidated by cooking I avoided lighting up the stove altogether. Normally this is not quite my type of thing, too many processed products being dumped into a pot. But they had the idea for twice-baked sweet potatoes, so I must give credit where credit is due. Actually, I thought these were some serious grub. But, and it might sound obvious, you must like sweet potatoes, and not just have the kind of tolerance for them reserved for those once-a-year dishes. You have to really like them, otherwise, don't bother. This is more about the idea than the recipe, since I didn't really measure. 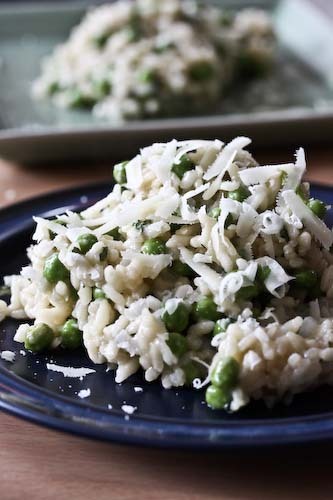 Use what you like in the quantities you prefer. Set the oven to 425, cut your sweet potatoes in half, and lay them cut side down on a foil-lined cookie sheet. Bake for around 30 minutes, until they are soft. Scoop out the centers into a bowl, leaving the skins intact. Mix it up with all of the other ingredients and then dump everything back into the potato skins. Bake another 8 minutes or so until everything is heated through. Enjoy! This looks SO good. 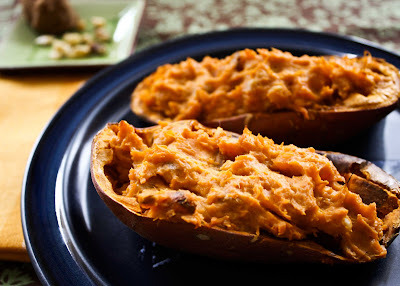 I love sweet potatoes and as I try not to eat regular potatoes anymore this recipe sounds perfect. I may try it tonight! I usually just mash them up but this is such a better idea! I adore sweet potatoes! I will have to try this some time. thanks for the note on my blog Andrea. I normally don't care for sweet potatoes, but roasting seems to transform them. 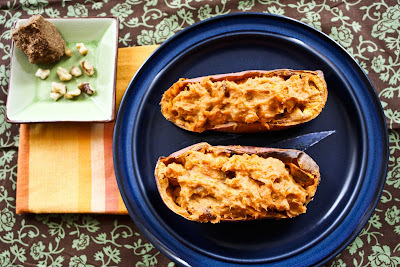 I love to eat roasted sweet potato!So this recipe is right up my alley. Yum! I am a big fan of sweet potatoes, so this might just have to go in the recipe file. I'm really enjoying your blog, too.